Amy reads from "The Off Season"
At East End Books, Provincetown, Massachusetts, July 20, 2018. From the Lambda Literary Review: "Given our exposure to daily political outrages, this might be the perfect time for Amy Hoffman’s frolicking portrait of Provincetown’s off-season community...."
When Nora Griffin, an artist in her midthirties, moves from Brooklyn to Provincetown, she isn't looking for trouble. Her partner, Janelle, is recovering from breast cancer treatment, and together they've decided that the quiet off-season on the tip of Cape Cod is the perfect place for Janelle to heal and Nora to paint. Then charismatic Baby Harris flirts into Nora's life in her red cowboy boots. When Nora Griffin, an artist in her mid-thirties, moves from Brooklyn to Provincetown, she isn't looking for trouble. Her partner, Janelle, is recovering from breast cancer treatment, and together they've decided that the quiet off-season on the tip of Cape Cod is the perfect place for Janelle to heal and Nora to paint. Then charismatic Baby Harris flirts into Nora's life in her red cowboy boots. In the damp, windy winter, Nora contends with heartbreak, aging, and local environmental worries, while painting what she hopes will be her masterpiece. Along the way, she encounters the chain-smoking, motor scooter-driving landlady Miss Ruby; Reverend Patsy, the vegan minister of the Unitarian church; and Brunhilde, barista extraordinaire and rival for Baby's affections. As the first tourists begin to arrive in June, Nora must decide what she really wants from life. An all-American coming-of-age story about a nice Jewish lesbian and her large family; from the eastern Europe migration to the present day. I began writing LIES ABOUT MY FAMILY because I was wondering about the stories that families tell—the stereotyped ones that are told over and over. Why those stories? What’s underneath them? What’s missing? This led me to do research in the ship-manifest records at Ellis Island and other Internet and written sources, to interview with my parents and aunt, and to gather up our few remaining, scattered family records. 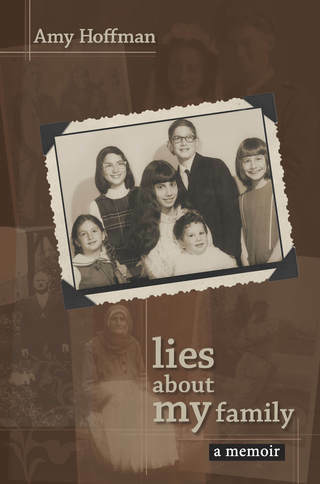 LIES ABOUT MY FAMILY examines what I discovered about my history and my relationship to it all—my Jewish heritage, my lesbian identity, and my radical politics. This interview aired on Goddard College's Woman-Stirred radio program. Amy is interviewed by Rachel Rubin, host of Commonwealth Journal on WUMB radio. Amy Hoffman reads from the first chapter of "Lies About My Family", "Spinning". Boston's weekly Gay Community News was “the center of the universe” during the late 1970s, writes Amy Hoffman in this memoir of gay liberation before AIDS, before gay weddings, and before The L Word. Provocative, informative, inspiring, and absurd, with a small circulation but a huge influence, Gay Community News produced a generation of leaders, writers, and friends. In addition to capturing the heady atmosphere of the times—the victories, controversies, and tragedies—Hoffman's memoir is also her personal story, written with wit and insight, of growing up in a political movement; of her deepening relationships with charismatic, talented, and sometimes utterly weird coworkers; and of trying to explain it all to her large Jewish family. Hospital Time is a memoir about friendship, family, and caregiving in the age of AIDS. Amy Hoffman chronicles with fury and unflinching honesty her experience serving as primary caretaker for her friend and colleague, Mike Riegle, who died from AIDS-related complications in 1992. Hoffman neither idealizes nor deifies Riegle, whom she portrays as a brilliant man, devoted prison rights activist, and very difficult friend. Hoffman became central to Riegle’s caregiving when he asked her to be his health-care proxy, and although she willingly chose to do this, she explores her conflicting feelings about herself in this role and about her involvement with Riegle and his grueling struggle with hospitalization, illness, and, finally, death. She tells of the waves of grief that echoed throughout her life, awakening memories of other losses, entering her dreams and fantasies, and altering her relationships with friends, family, and even total strangers. Hoffman’s memoir expresses the psychological and emotional havoc AIDS creates for those in the difficult role of caring for the terminally ill and it gives recognition to the role that lesbians continue to play in the AIDS emergency. A foreword by Urvashi Vaid, former executive director of the National Gay and Lesbian Task Force, offers a meditation on the politics of AIDS and the role of family in the lives of lesbians and gay men. Hoffman’s memoir expresses the psychological and emotional havoc AIDS creates for those in the difficult role of caring for the terminally ill.